With another working week behind me it's good to look back on it in terms of perks. By this I mean the added benefit of slotting in some photography at the end of a late shift (3.30pm - 11.20pm). It's been quite some time since I done any after work shots - in fact, almost 4 months. I could rattle on about the reasons behind it, but I'd be writing all day and night, so best give it a swerve. Bottom line is - it's was great to get back on the horse, so to speak, and to take advantage of a couple of clear night skies for more of that thing that is known as astro photography. When conditions aren't ideal I usually head straight home after work and chill out in front of the box for an hour or two, before heading off to bed. When the skies are clear, there's no such luxury, as I head off into the night, which is usually cold and all things considered, I question my sanity haha!! But this photography lark has a way of getting under your skin, especially at night under the stars, when the creative juices start flowing and the fingers and toes start freezing! It's all part of the fun though. A giant image, based on the Lewis Carroll book Alice’s Adventures in Wonderland, has been created on the side of the old science block at Chuter Ede Community Association in South Shields. The mural is unique in that it is the first outdoor UV piece surrounded by lights and timers to ensure it gives off an ethereal blue glow at night. 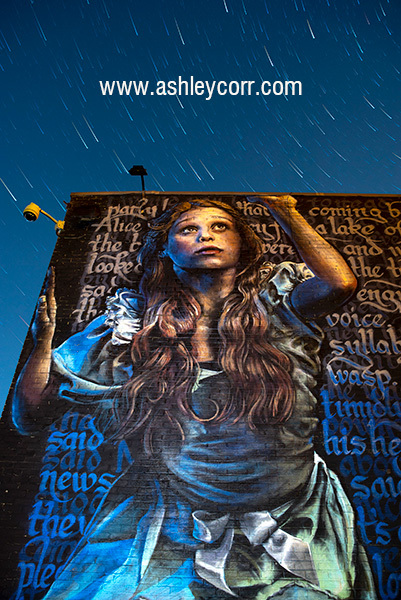 This exciting development in site-specific street art references Lewis Carroll’s frequent visits to South Tyneside and the street in Biddick Hall named after him, Carroll Walk, is augmented by special UV lighting at dusk. “In a world first, UV paint is illuminated at night. 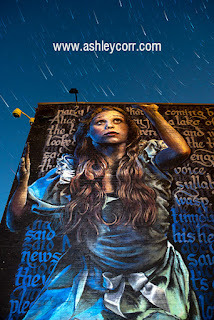 bringing up the detailed portrait of Alice by artist Irony and the calligraffiti by locally-based Frank Styles.” The work shows a giant Alice trying to break out from the surreal work surrounding her. The text around her is a letter about a missing part of the story cut out of the book because the illustrator didn’t want to draw it. Mr Styles said: “Irony had created a few indoor works of art using UV paint, but this is the first time one like this has been made outside. Due to the weather conditions, we were there for a week." plan B in no time, opting for a head on shot up close, with the stars raining down on Alice. I thought this would work well, especially as Alice looked like she was reaching for the stars. I went with this idea.